When looking for the perfect first dog, my search led me to the local SPCA. I had a short list of breeds that I was interested in, and thought that they didn’t have anything to match my list. I actually passed him over – didn’t even see him! My little black dog was sleeping in a dark corner in their small dog room and if I hadn’t taken a few moments to read over the list of dogs in that room, I would have walked right out without him. 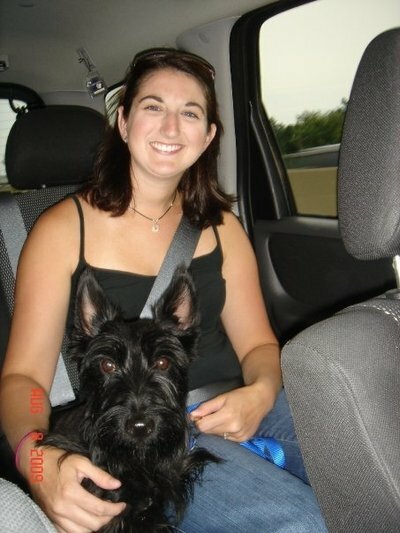 But when “Scottish Terrier” jumped off the page at me, I had the feeling I had found my dog. Once the volunteer brought him out into a run for me to meet, I knew he was the one. We took a short walk and by the time we returned, he sat right on my feet while I filled out the paperwork. (It’s still one of his favorite places to sit.) Leaving him to be neutered was one of the hardest things I have ever done – I wanted him to be with me right away! His feisty terrier attitude has been a challenge some days, but his “head up, tails up” attitude makes him perfect for me. About 11 months after I found him, he was the ring bearer in our wedding. I can’t imagine having that day without him as a part of it and my life without him.